There’s a moment in “Gold Stars” when the story goes from good to great, an event that dramatically changes the context of the episode by revealing a frightening unseen aspect of the naïve, innocent Sweet P. Before that point, “Gold Stars” is an entertaining, but not particularly memorable chapter of Adventure Time, telling a traditional morality tale about the dangers of trusting strangers. There’s a lot of Pinocchio in Seo Kim and Xomvilay Xayaphone’s script, which follows Tree Trunks and Mr. Pig’s adopted son Sweet P. (who is also the reincarnation of The Lich) as he goes to school for the first time and is led astray by two manipulative conmen. One of the strangers Sweet P. encounters is the King of Ooo (Andy Daly), who returns to the show for the first time since his debut in “Apple Wedding.” It turns out that Princess Bubblegum’s suspicions were correct and he really is a nasty dude, teaming with his dog/attorney Toronto (Paul Scheer) to turn Sweet P. into a criminal accomplice this week. They teach Sweet P. a hypnotic dance that paralyzes people with laughter, making them vulnerable to pick-pocketing from the King and Toronto, who are raising funds to stage the King’s big comeback following his disgrace at the hands of P.B. In exchange for Sweet P.’s help, they give him pieces of garbage cut into stars and dipped in gold paint, and when they reveal their true selves to Sweet P., he reveals his true self to them. And his is a lot scarier. Daly and Scheer are a great comedy team, with Daly doing particularly excellent work as the slimy King of Ooo that takes immense joy from making others do his bidding. 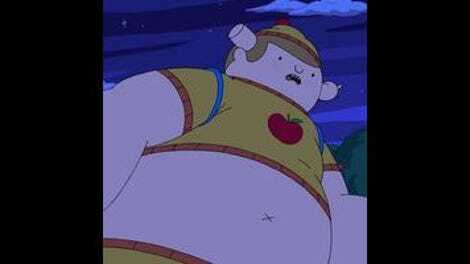 The King of Ooo is the kind of over-the-top amoral character that Daly excels at bringing to life with confidence and charisma, and like the best Adventure Time voice actors, there’s a level of commitment there that makes the King a fully formed character. Voiced by child actor Ethan Maher, Sweet P. is an utterly adorable character, and his personality and appearance belie the dark heart he has within. That dark heart is given life by the gravely voice of Ron Perlman, and the episode mines a lot of creepiness by layering Maher and Perlman’s voices on top of each other. The episode opens with a terrible dream Sweet P. has of his former self, but the neon green intensity of The Lich nightmare quickly gives way to softer pastels when Sweet P. wakes up. The Lich is quiet for much of the episode, but that moment when he takes control is when the narrative becomes more substantial by delivering a terrifying history lesson. 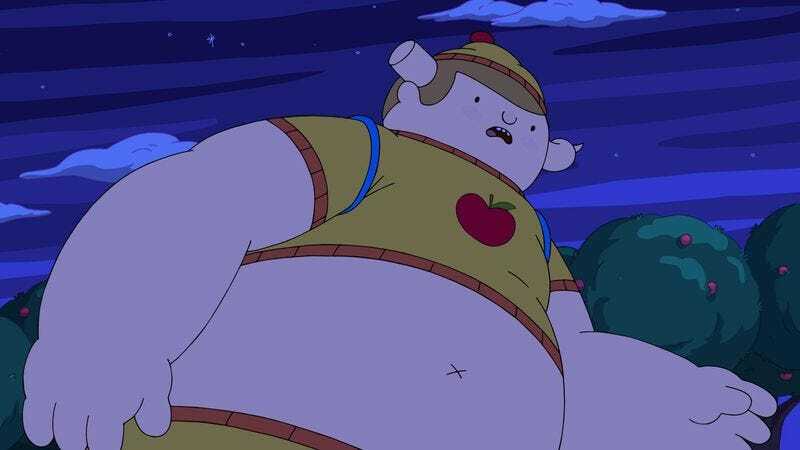 The King and Toronto threaten to burn down Tree Trunks’ orchard unless Sweet P. runs away with them forever to be their dancing slave, and when they call him a “baby-man” like the bullies on the playground, they awaken his dark side and allow The Lich to take over. “Stop,” The Lich says as the background disappears and the characters are enveloped in darkness, an abrupt transition that signifies a major shift in the plot. From here, it’s time to learn some history: Before there was anything, there was nothing. And before there was nothing, there were monsters. I have the feeling that these monsters are going to be playing a part in this series moving forward, and the entire sequence hits hard because its such a strong departure from the rest of the episode. Sweet P. isn’t all that interesting a character. Sure, he’s a giant toddler with one and a half horns, but his story is one that’s been told before. He’s a child that is taken advantage of by strangers, who use him for their own personal gain. But where Sweet P. differs from Pinocchio and Oliver Twist is in how he deals with these strangers when he learns their true intentions. Sweet P. is interesting because of The Lich. He’s interesting because of the contrast at the core of his character. He may look and sound like a child, but that body houses an ancient spirit of darkness, and leaning into that dynamic pushes “Gold Stars” to horrific heights. I love the giant family portrait of Sweet P. holding his adopted parents that hangs in Tree Trunks and Mr. Pig’s home. The size disparity makes all their interactions humorous. Tree Trunks and Mr. Pig have a very active physical relationship. Good for them. So does Sweet P. have some sort of hypnotic power over people? His dance has an almost psychic impact.